Another combined nature walk/art lesson. I am taking advantage of all the gorgeous fall days before the winter cold sets in. So we hiked through our woods, trying to be real quiet in case there were any more bears or maybe deer. We picked up little things —- leaves, acorns, pinecones —– and sat down to draw. I drew an acorn in Prairie’s sketchbook. 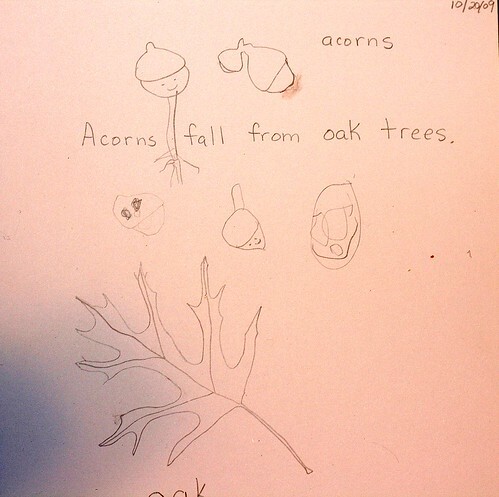 She drew her own acorns and gave them faces. Then I drew an oak leaf. I encouraged her to draw her own oak leaf, but by this time, we were getting eat up by mosquitos and doing more slapping than drawing. The blood-suckers put a quick end to that art lesson.